Elbow dislocations are the second most common dislocations in adults, behind the shoulder. 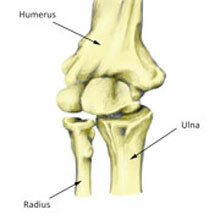 The elbow is a very stable joint and so it requires a lot of force to dislocate it. Severe pain and obvious deformity are the common symptoms for this elbow injury, which is normally caused by a fall or direct impact. Read an explanation of elbow dislocations, treatments and how to rehabilitate after the injury. A dislocated elbow occurs usually as a result of a fall, or a direct blow and often involves an associated fracture of the Radius, Humerus or Ulna. The most common mechanism involves falling onto an outstretched hand, with the arm away from the body and the elbow being forcibly flexed on contact. There is usually also a twisting movement. This results in a posterior dislocation which accounts for up to 90% of all elbow dislocations. In a posterior dislocation, the Ulna or the Radius (sometimes both!) moves backward. When the elbow is dislocated posteriorly this can be either partial (also known as a subluxation) or complete. With a partial dislocation, the joint surfaces are separated by a small distance and usually reduce (return to their normal position) either instantly or with very little help. A complete dislocation occurs when the joint surfaces are considerably separated and can require a manual reduction (by a Doctor). Dislocations usually involve damage to surrounding structures, most often the ligaments of the elbow joint, fractures to the Radius or Ulna or damage to the nerves or blood vessels which pass close to the elbow joint which may become trapped (pinched) by the moving bone. What can a professional do? This involves manipulating the elbow into a position which forces the bones back to their natural position. A rehabilitation program should then be followed. Following a period of immobilization, gentle mobility exercises should be commenced to increase the range of motion at the elbow joint. Once the range of motion is close to normal, strengthening exercises for the muscles surrounding the elbow should begin.